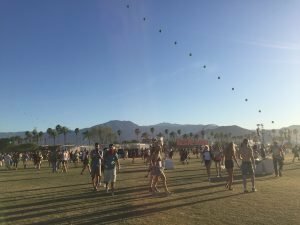 UK girls guide to Coachella. 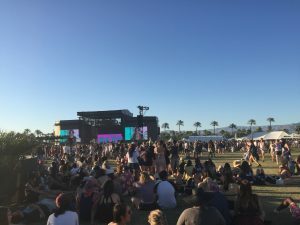 If you’ve heard of Coachella it’ll be through the high gloss magazines that each year highlight Coachella as one of the major summer festivals, then proceed to flaunt who was there, what they were wearing and tantalise you with incredible photography. 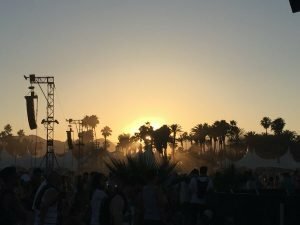 It’s pretty hard not to be lured by Coachella; you’ve got the IT girls in the most fabulous boho clothing, the abundance of palm trees, the enviable clear blue skies, the striking sunsets and of course the incredible line up. It’s everything the magazines say it is. If you’re into festivals then it’s pretty comparable to Glastonbury but the scale is much, much smaller (but then again Glastonbury has been running almost 30 years longer) and as it takes place in the desert you’re pretty much guaranteed sunshine- it was pretty much 98º the entire time we were there. Any avid festival goer should go. 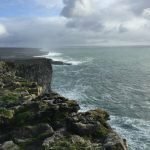 If you’re desperate to go- it was a bucket list item of mine- then here are my top tips! The dates are yet to be announced for the advance tickets sales (your opportunity to buy your tickets through a payment plan) but based on 2016, this will go live early June. Based on my experience, they usually vocalise the sale dates only days in advance. So keeping up with their news channels through the Coachella website, Facebook and Twitter pages is essential. This is actually the cheapest method of purchasing tickets, although likely to go up for the 2016 festival these were $375 each. The next opportunity to purchase tickets is through the general sale which takes place early January. You’ve no payment option available here, payment will be required in full and is slightly more expensive than the advance sale tickets- these were $399 each. Again notice of sale is last minute! 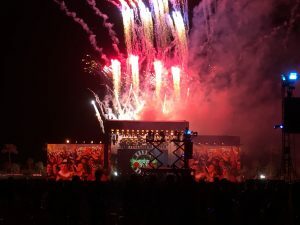 Saturday night headliners Guns n Roses played for 2 and a half hours! 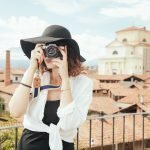 Another option through the preferred sales channel is the travel packages. 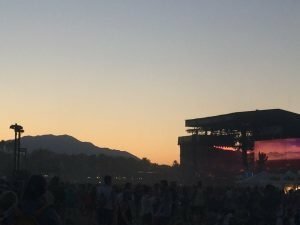 Sold through Valley Music Travel the prices include general admission tickets to the 3 days of the festival, 3 nights accommodation and a shuttle transfer service to and from the hotels each day for between 2 and 4 people.Prices started from $2,100. These go on sale shortly before the general sale and it seems that there was a further opportunity even when they were seemingly sold out so well worth keeping your eye on if you opt for trying the general sale but didn’t get tickets- these packages weren’t as quick to sell out. Check out the hotels offering places for this years festival. You also have an option to purchase tent and teepee packages as well- see the buy passes page for further information. If you miss all of the above opportunities, then 3rd party options are available. We’d recommend Stubhub, Vivid Seats was also a recommended site though their fees are a lot higher. Obviously, the tickets through 3rd party sales are more expensive- the tickets themselves are about $75 more a ticket than general sale plus around $95 in fees per ticket too- and although Coachella don’t advocate third party sales- if you have any problems with your band then this could be an issue- Stubhub offer a seller guarantee so if you’ve any problems they’ll either source you a new ticket or refund you the money. Ticket sale times is reflective of PST/PDT time- basically if they say 11am, they mean 11am LA time, it’ll be 3pm here. Your ticket does not include camping- you either have to purchase a camping pass or source alternative accommodation, see below. Your ticket is your wristband- your wristband must be activated in advance (details are included in your pack), worn on your right wrist. No-one it seems physically checks your wristband (they may request you to show your arm but that’s usually it), they use machines to scan the barcodes in the bands as you go in and out of the festival. As long as it’s registered they don’t mind who they’re registered to. If you encounter problems though, they’ll only deal with the person who purchased the tickets (I am told) BUT if the wristband is activated in your name, I’m sure this would be sufficient. Tickets are sold in dollars, expect to pay slightly more for UK delivery. As highlighted above, your ticket does not include camping. Camping passes can be purchased through the general sale but purchases can only be made in conjunction with a festival pass purchase. 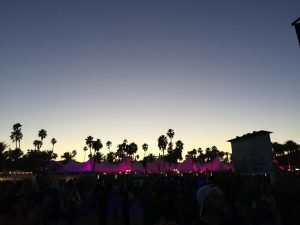 Therefore if you’re looking to use third party channels, you’ll not be able to buy camping passes. Camping is an additional $99 per camping space (not per person). Alternatively, there are the travel, tent and teepee packages covered above which do include tickets to the festival. If you’re looking to stay in a hotel, I’d highly recommend considering staying in Palm Springs. It’s a 40 minute drive to the festival site but it’s well worth it. Palm Springs is a beautiful oasis and means you can have the calm with the manic- it’s a perfect balance. 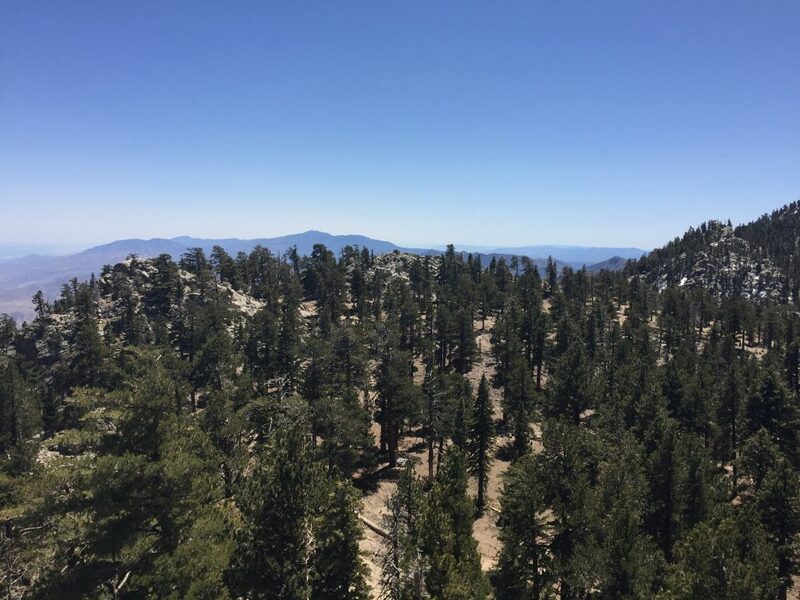 Palm Springs became popular in the 50s with huge thanks to Elvis Presley, Marilyn Monroe and Frank Sinatra who all frequented the area as a way to escape the manic city life in LA and celebrities to this day do the same. They either own property here or have dedicated rooms at their favourite hotels. It’s not hard to see why; the streets are lined with palm trees and gardens blooming with seasonal floral, crystal clear waters are everywhere and the mountainous backdrop is the bow on the present. And, like the festival, is a hub for almost year-round perfect weather. It’s breathtakingly beautiful. Palm Springs still has that retro feel about it, you do feel like you’ve been transported back in time. The houses are still reflective of the 50s as are the outward appearance of the shops, restaurants and gas stations and classic cadillacs are a car of preference in the area. If you’re looking for a hotel recommendation, it would have to be Colt’s Lodge. The service was incredible, the food (breakfast is included) delicious, the rooms comfy, the pool luxurious, free parking available and as an added bonus, they’ve bikes you can borrow to experience the area in a whole other way. A further advantage of staying outside the festival area is the accessibility of shops, restaurants, ATMs etc. on your way in and out so if you needed anything, including a preference to dine out, you had those options. If you team it with a trip to LA, like we did, you’ll pass the largest wind farm in the world on your way down, which is a really strange, futuristic sight- although clearly not a reason to go alone, it is quite unusual and something to look out for. Weirdly, it’s like the friendliest welcome to the area there is. You’ll also pass through the Desert Hills Premium Outlets which is well worth a stop! ANY outlet in America is well worth a stop. 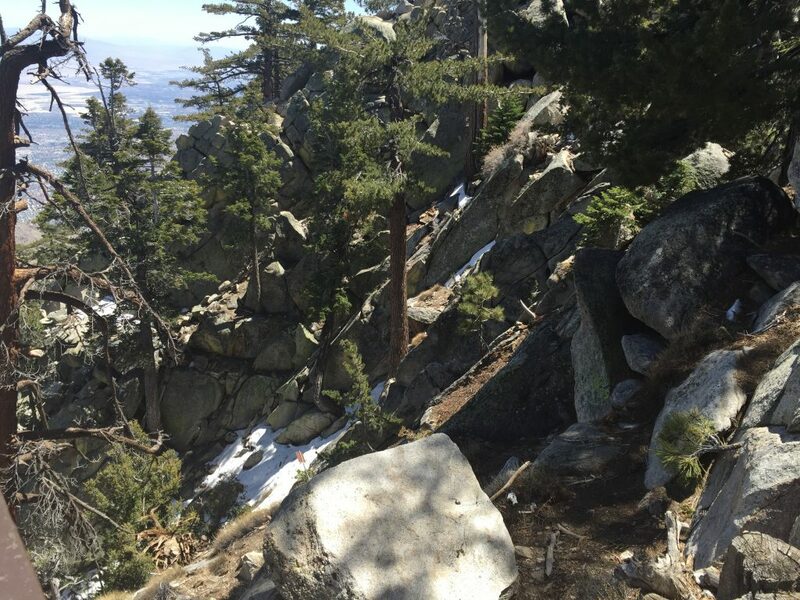 Whether passing through or staying in Palm Springs, the Aerial Tramway is an essential stop. 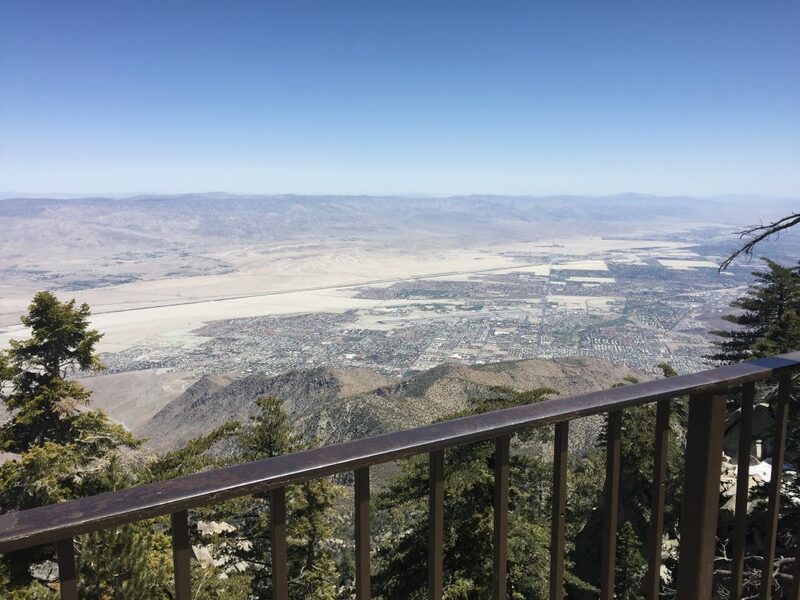 Travel up 8,500 feet above sea level and to the top of the world where you’ll get the best views of the Coachella valley. Ensure you take a jacket with you though as you’ll likely experience two very different seasons on this particular adventure- when we went up, the mountains still had a dusting of snow! Whilst there, follow one of the many hiking trails through forestry or step out onto the balcony for breaktaking views (quite literally so, it was pretty cold when we went), observe the forest or desert from one of the two restaurants and learn more about the wilderness and the tram itself from the sites exhibitions and movies. 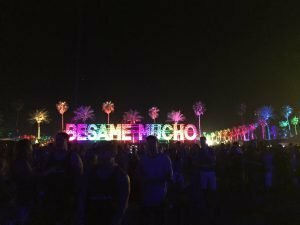 Coachella Valley (Indio) is the best setting for a festival ever! Download the Coachella app– as it’s a great way to stay on top of the line-up. Schedule the bands/artists you want to see and plan your day around that. As I say, it’s extremely hot so perhaps a morning poolside if there is no-one you want to see wouldn’t be such a bad idea- you’ll want to come home with that california glow anyway. Be mindful of storms- as we experienced, if the winds are high sand will go everywhere. Although it wasn’t too bad when we were at the actual festival (on this occasion), getting to and from the car park was incredibly dusty! Wear your sunglasses or take eye protection and either wear a scarf around your mouth or nose or take a mask- trust us, it’s really not pleasant. 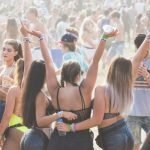 You’ll likely get a better deal for your hotel if you book a day or two in addition to the festival dates- obviously this doesn’t apply to the packages outlined. Shopping around is essential but hotels book up extremely quickly. 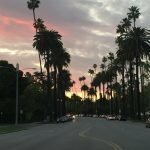 Hire a car- it’s pretty difficult in this area of California to get around without one. If you really want to get up close and personal with celebrities a VIP access band is essential as they do have designated areas, however, you can always loiter near the VIP areas as access is available from two different sides- many models were having photo opportunities near the VIP area of the main stage. Keep your eyes peeled when around the festival as well as many of them will be moving around the festival seeing their favourite bands. If there is anything you’d like to know that I’ve missed, don’t hesitate to leave me a comment! I’d be happy to answer your queries.